Frederick Naff was born in California but has lived for the past 30 years in Greece and lived for 3 years in Italy for studies and ministry. He met his wife Anastasia in Italy while she was also studying there. Fred has an independent architectural firm in Greece and has worked on numerous projects as an architect and a project manager in both the United States and Greece, as well as in Croatia. He also works with Greater Europe Mission’s Design Group, where he provides architectural consultation and design services to organizations throughout Europe. Fred is proud of his European heritage, with ancestors who moved to the U.S. from Switzerland ‘just’ 300 years ago. His hobbies are listening to jazz music and drinking good coffee with friends. He is currently working on a book about vernacular architecture and pursuing a doctorate in architecture at the National Polytechnic University of Athens. 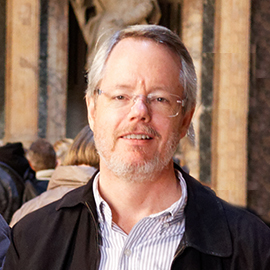 Professor Naff teaches Understanding the Art of Architecture at Rome with Purpose.